…and yes, they do start to bubble a bit after which they are immediately removed from the pan. I suppose if you had multiple pans of hot lard, these could then be immediately dunked in the hot fat, but in our case, we had to remove them, then add lots of wood to the fire to bring the fat up to temperature, and that is very, very HOT lard. Why not stop at either step 2 or 3 then do the final fry at the point of sale? That way the chicharon will be extremely fresh and crunchy. How about some chicharon bulaklak next. I actually prefer them over pigskin but it probably has much more cholesterol. The photos are spectacular! Love the laman! I like it when the laman is thick enough that there is minimal “curl” in the chicharon :) Don’t lose to much of it when you get your new batch! Gads, my mouth is watering! The photos have me drooling… Chi. Cha. Ron! this calls for heaping mountains of rice! Must get hold of chicaron…NOW!!! Will wait for Zubuchon chicharon…hopefully soon MM! Oh I never knew that the process was that complicated! :-/ Work area must have been a great big mess. Will just wait til you sell your own brand commercially. Hope you come up with all sorts of flavors, ala chicharritos. And yes, chicharon bulaklak too!!!! It’s hard to get a hold of fresh chicharon bulaklak. Those being sold at the malls usually taste rancid probably as a result of overused oil. I used to buy chicharon made by SLERS in CagayanDeOro and it was better than all the chicharons I’ve eaten and was readily available. They also sell chicharon with bits of laman which I ate frequently for meals paired w/ suka and garlic rice(much to my Mom’s disgust). Whew, this picures reminded me of that particualarly sinful but heavenly meal! In my younger drinking days, my favorite sumsuman was chicharon bulaklak where the pork intestines literally “flower out” after their deep fry. I find them tastier than the carcar especially when dipped in spiced vinegar. If carcar was the only choice, I would opt for the garlic flavored. I used to get them from Quezon Blvd Chinese bakeries in Manila. MM, check with Wahini if her uncle can give you the pork rind that you’re looking for. 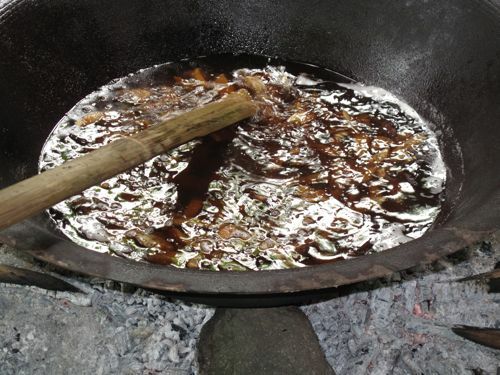 Tonceq, my cousin in Qzn Prov do sprinkle water (or use a spray bottle) when frying lechon kawali or fried chicken. They do have 2 kawas going, isa with med hot oil for 1st frying, dun sa 2nd, malakas ang apoy (they use wood). Sa paglalagay lang ng spices ang natoka sa akin, takot ako sa pag-prito…yeah, lalo na pag-nagtilamsikan na yung mantika pag-winiwisikan na ng tubig. Pero ang lutong talaga. MM, the chicharon that you served as appetizers during the lechon eyeball was heavenly enough – i mean, if you told me then that that was all we were having with rice, i would have been happy (but after tasting the kinilaw, and the lechon sisig, and the lechon….ummm, i don’t think so!). i guess that was from carcar, right? 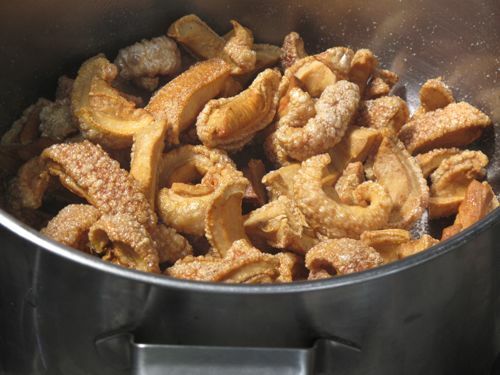 i’m a coward when it comes to cooking with sputtering lard, so i will happily pay the P500/kilo charged by the chicharon makers in the carcar rotunda. 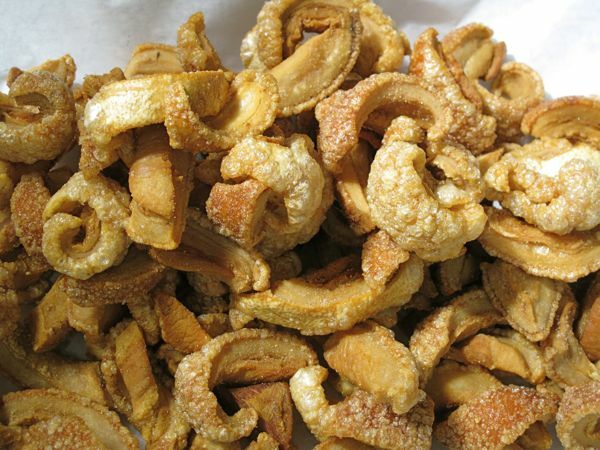 chicharon from betis, guagua, pampanga is also a must-try. One can opt to buy the ‘pabato’… I think these are the rendered and dried pieces. Then these can be cooked at home. I personally find Carcar chicharon to taste slightly overcooked. I have yet to find consistently good chicharon. My benchmark would be crunchy outside but soft inside with a slightly stick mouthfeel. Hope you can come up with the perfect chciharon. it’s so messy cooking chicharon–I dry the boiled skin in the oven under low heat…but I can’t stand the splattering of hot oil..AND I have to clean it after…keep up the updates, MM!! don’t get battle-scars..
My Capampangan side of the family (Dad’s) makes an excellent chicharron in California…my grandmother’s house is like warping into Pampanga when you set foot in her door. They have a “dirty” kitchen outside where all the major cooking takes place. It never seems to get makunat, even when they mail it in a care package to me and my sister here in NYC. ;p We throw it in the freezer and it keeps pretty well. Natie: I have always lived by the rule, that less is better…and that goes for the less utensils and pots and pans to wash esp. Try the steps I posted earlier…cutting the pork skin to size and season them and dry them in the oven…200 degrees. The first batch I made only took the whole afternoon to dry and about 3 hours into the night. After the last step of rendering the fat the next day, …frying in hot oil …NO SPLATTERING whatsoever. Not too much laman also yieded an far more excellent product. There is just a tiny bit left on the skin before frying. The pigue skin yieded a product that is akin to the ones you buy…and puffed really nicely. If you want to use the pork chop skin, ask your favorite butcher to give you the skin from a fairly young pig. You can tell the difference for the skin itself is not as thick as the mature ones. Hi MM/Betty Q, have you tried Fergus Henderson’s crispy pork skin? It’s a new dimension! I thought about this post while visiting a local turo-turo. Inside I noticed some chicharon behind the counter, all in plastic bags, divided to sell. I was tempted to ask if they were prepared ‘in-house’ and if fried in lard. Next time perhaps. Other than pinakbet, chicharon also goes great wtih balatong. @ vettivette – I think the dirty kitchen is pretty much standard among Asian homes. the chicharon looks good! your passion in food resonates overwhelmingly. chicharon making isnt the easiest to do. your passion translates to this difficult venture. kudos to u!! The final chapter….”Finally “tonight i fried my Chicharon! they look as good as yours,of course,i did not fry them on woodfired stove, my gas stove was suffice,sure its a lot of work, but its all worth it! the end results are so goood,they will be shared with friends!! Thanks MM for the Chicharon crhronicle! !and i made my first Kare kare out of your archives,turns out well,when i was home i was ,never pay attention to cooking,cookbook doesn’t help a lot,your blog are so detailed,i love trying things i never cooked before. ang hirap pala gumawa ng chicharon! :) and to think it only takes me less than 10mins to eat a pack. 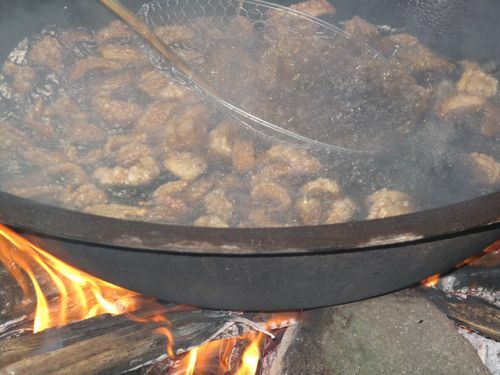 all that hard work just to produce chicharon, amazing! the chicharon was provoking me.. talap talap, wattery mouth..hmm,it was so devastating.. Decent chicharon are those chicaron that are simple. Messy chicharon are gorgeous.. Luv it. true, you must also try the chicharon from central luzon ,the ones from pampanga (after, i have tasted it for the first time, i kept craving on it).they are so delicious, crispy yet tender to the bite.great for pang-ulam with bagoong and tomatoes and plain rice.theirs are large pieces and with a perfect balance of saltiness.sarap! i am from pampanga and i grew up eating chicharon cooked from my lola’s kitchen. it is called “pititchan” in the dialect and it is just as good (or can i be biased and say better) as the ones we buy in plastic bags. i know how to cook it, in three simple steps – simmering, rendering and frying. no kawa needed and my small kitchen in my condo can handle the tolerable mess. ..wow kuya..im so thankful at napanood ko kau sa jsca soho..galing tlaga..
its true to make a chicharon is really hard oras ang bibilangin mo..gud job MM, in my hometown we called that…. PUPOR a homemade chicharon. grabe, it looks so delicious…. chichariffic! 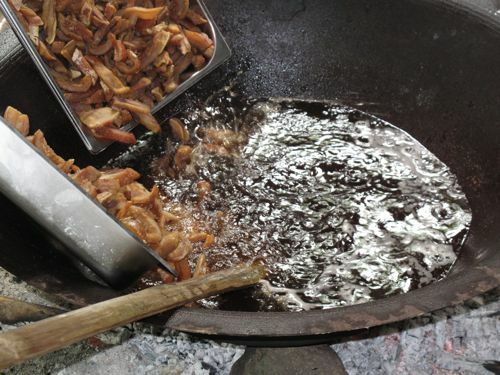 JUst want to share lang…My mom was a meat vendor for a decade and during those times, she used to bring home some back fat taken from the kasim part… I guess that was the best part for making chicharon.. It usually take 12 hours before i have the chicharon to be really crispy, because after having it pre cooked, I still have to wait until the skin has dried out so that when i deep fry it, it will pop out.. Yes, the kitchen was messy after cooking at least a kilo, but it pays well… the chicharon was also good for dinuguan,,, pag hindi naubos,, recycle di ba???? 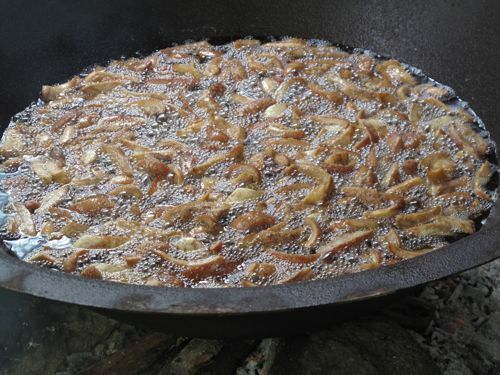 i’m an avid fan of yours, since your on the topic of making chicharon, would you mind on making some chiharon bituka? TIA! A Seriously Calorie Packed Merienda!